I figured I'd try something a little different this year and combine three of my favorite Wisconsin foods – cranberries, tart cherries and maple syrup. Cherries are naturally sweeter than cranberries, so this allows you to cut back on the sugar compared to standard cranberry sauce. Maple syrup and sugar also have trace minerals not found in refined sugars. And, of course, brightly colored cranberries and cherries are also loaded with antioxidants. Heat water and sugars (or syrup) to boiling in 3-quart saucepan over medium heat, stirring occasionally. (Syrup will result in a thinner sauce.) Continue boiling 5 minutes longer, stirring occasionally. 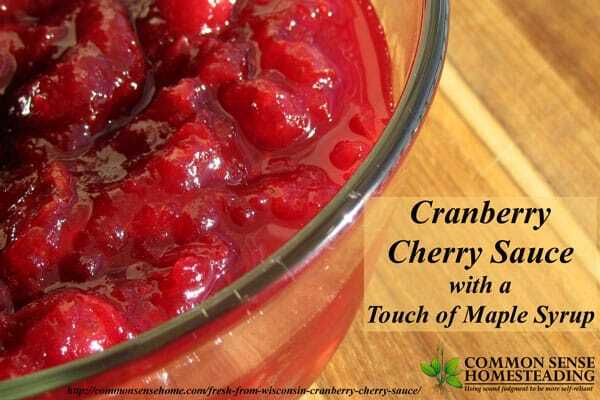 Stir in cranberries and cherries. Heat to boiling over medium heat, stirring occasionally. Continue boiling about 5 minutes longer, stirring occasionally, until cranberries begin to pop. As the cranberries pop, they release pectin, which will help to thicken the sauce. Pour sauce into bowl or container. Refrigerate about 3 hours or until chilled. Sauce will thicken as it cools. Sugar acts as a preservative, plus the fruit is fairly acidic, so this should hold very well in the refrigerator. Have a wonderful holiday season. Don't forget to share if you find this post interesting. Wendy – I hope you enjoy the sauce. 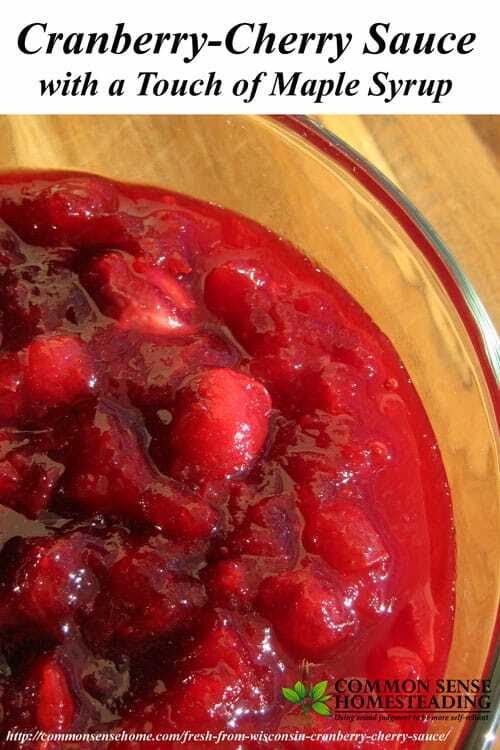 Cranberries are very common in the US around the holidays. Do you see them much in the Netherlands?